Chandler, located in Murray County in southwest Minnesota, was platted in 1886. Early area residents were drawn by the availability of fertile farmland and endless opportunities. That farmland continues to serve as the basis for the area's economy and to provide new opportunities for today's residents and future generations. Take the time to explore some of what Chandler has to offer....from our beautiful park and community center to thriving businesses and active churches and organizations. Chandler truly is a "Nice Place to Live, Trade & Worship". 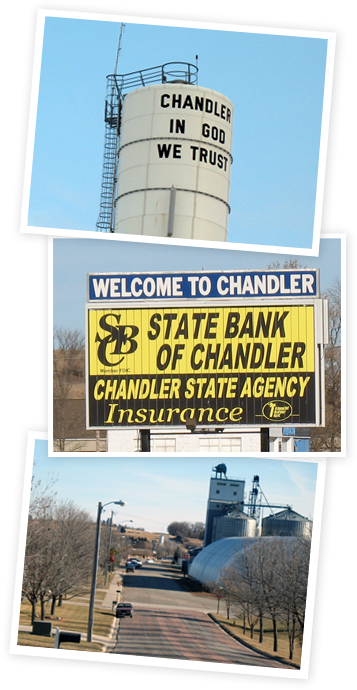 © 2010 City of Chandler, MN. Website by iReed.